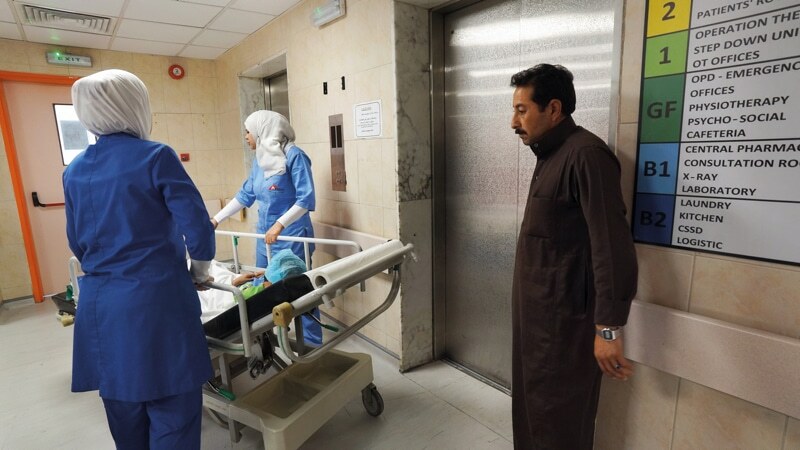 “She is the cleverest of all my children,” says Abdel al-Hanan Jasin softly, looking at seven-year-old Fatima, lying in the hospital bed next to him. “She wants to be a teacher or a doctor.” Fatima looks back at him from under the long lashes of her left eye. Fatima clearly inherited her dad’s distinctive almond-shaped eyes. But that is all I can tell. The rest of her face is disfigured beyond recognition, her other eye gone. The disaster happened in November 2015 in Aleppo in Syria. Fatima, then five years old, had just run outside to play when the house she was standing in front of was bombed. The air was darkened by a choking cloud of detritus and dust. A neighbouring family had been killed. The happy chatter of kids was replaced by screams. Terror seized Fatima’s mother, Kifa’a Jasin. She ran outside to find her small daughter being pulled from the rubble. Rushed to Aleppo’s Al Razi municipal hospital, Fatima clung tenaciously on to life, her distraught parents at her side. A month later, her life no longer in danger but severely disfigured, Fatima was discharged. Every penny of the family’s one million Syrian pounds of savings – just over £3,500 – had been spent on her treatment and there was nothing more that could be done for her. “Every day, Fatima was full of fear and upset when she saw her face,” her father recalls. He was despondent, unable to help her. It felt like the end of the line. By the time Fatima left Al Razi hospital in late December 2015 one in ten of the Syrian population had been wounded or killed in the civil war which started in 2011. An estimated 4.6 million Syrians had fled the country. Fatima and her family joined the exodus, finally arriving at Azraq camp in Jordan in early 2016 where they made their new home among 27,000 of their countryfolk. Abdel al-Hanan Jasin had never heard of the medical NGO Médecins Sans Frontières when a coordinator from the organisation stopped by his family’s shelter shortly after they arrived and enquired after his daughter. Less than two months later, Fatima was admitted to the Médecins Sans Frontières-run Hospital for Reconstructive Surgery in Amman, Jordan where she had remained for all but two months by the time I met her in April 2017. By that stage she was waiting for the eleventh round of surgery to reconstruct her face. Syria was the last Arab country to be swept up in the Arab Spring. It had appeared a more stable society than many of the nations plunged into revolution. But when security forces arrested and tortured a group of teenage boys for painting revolutionary slogans on a wall in Dara’a, 100 kilometres south of Damascus, it provoked local protests. After security forces opened fire on the demonstrators in March 2011, nationwide demonstrations erupted, with crowds demanding president Bashar al-Assad’s resignation. Assad refused to go and the country spiralled into civil war. Homs fell under opposition control and swiftly became known as the ‘Capital of the Revolution’. Assad responded with a vicious government siege. By April 2013, the UN’s Office of the High Commissioner for Human Rights (OHCHR) estimated that 16,400 people had been killed in Homs, 1,700 of whom were children under ten. The assault was successful: by May 2014, only the Al Waer district of the city remained under opposition control. 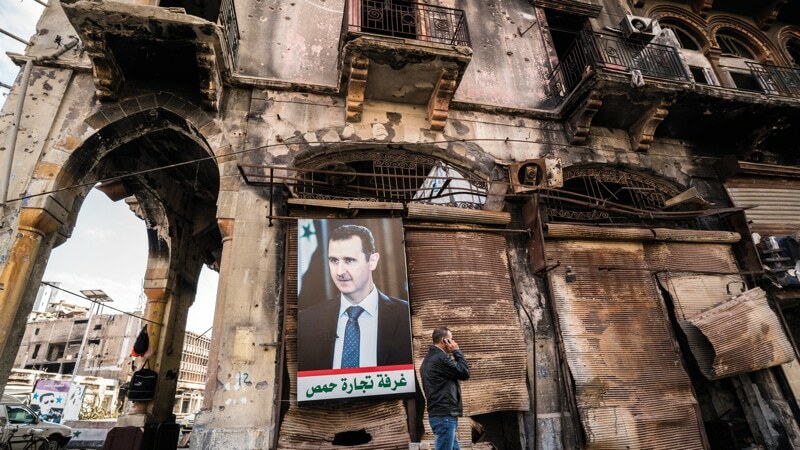 Despite reclaiming Homs, Assad had failed to win a decisive victory over the rest of the opposition in Syria by 2015, and it was widely expected that he would fall. But that autumn, as diplomats in Vienna hashed out a peace plan, the conflict intensified. The government launched a siege of rebel-held East Aleppo, an action so brutal it was dubbed “Syria’s Stalingrad” by the media in reference to one of the bloodiest episodes of the Second World War. By the time the siege ended with the defeat of the opposition in December 2016, 31,000 people were estimated to have been killed. The victory in Aleppo was aided by outside forces. On 1st October 2015, Russian planes helped conduct the first of hundreds of air strikes on Assad’s opponents which would be instrumental in turning the tide in favour of the regime. The strikes initially focused on rebel-held territory that threatened Assad’s Kuweires military base to the south-east of Aleppo: Fatima and her family lived right in the heart of this area. In mid-November 2015, as the diplomats in Vienna breathlessly announced they had finally agreed a peace plan, the five-year-old was injured in the airstrike which killed her neighbours. I first applied for a visa to Syria in January 2017, with the stated intention of visiting Homs and Aleppo to look at the challenges of reconstruction in those cities. 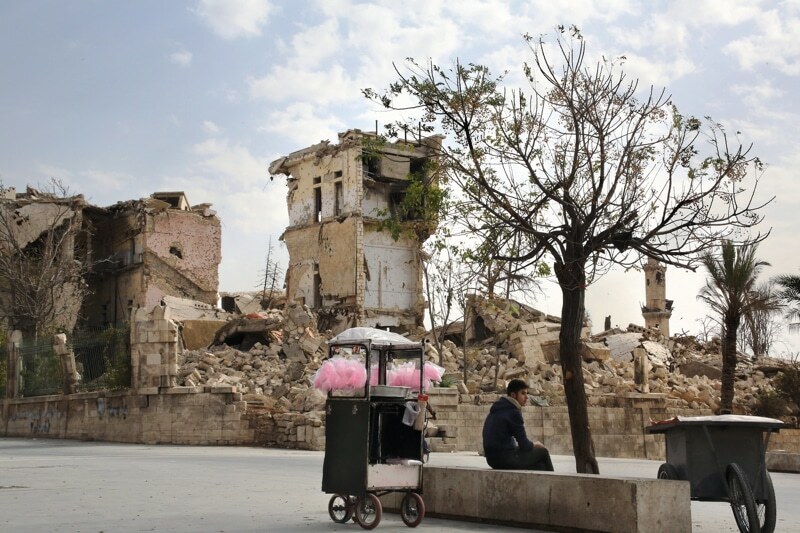 They were symbolic bookends – Homs the beginning of hope for change and Aleppo the end. I didn’t expect to be approved as government visas are only rarely granted to journalists, so when mine arrived in October 2017 it took me by surprise. Two weeks later I was in Damascus, threading through heavy traffic into the centre of town, past shimmering mosques and the impressive Damascus Opera House, overlooked all the way by the ubiquitous image of Bashar al-Assad, his eyes seemingly following my every move. That evening I ate at the hotel restaurant as Abba played on the PA, before retreating to my ninth floor room overlooking the city. There I listened to the thud of mortars pounding the life out of rebel positions in nearby Eastern Ghouta until they tapered off around midnight. The road north of Damascus rolls gently through an arid valley with low mountains cresting in the distance. The highway leads to Homs and as we get closer to the city it is lined with evergreen trees, pitched at a dramatic angle. Two ionic columns support an arch at the entrance to Homs, an allusion to a history stretching back to the first millennium BC. At their base an image of Bashar al-Assad and his father, Hafez, flaps askew on a flimsy wooden frame. Three years after most of the city was reclaimed by the regime, the centre of the commercial district is bustling: street vendors hawk brightly coloured vegetables, shops sell clothing, sweets and falafel, the blue and orange Homs football team flag flutters and a red and yellow Ferris wheel turns slowly. Nearby a young boy cycles through a park that was once a notorious no man’s land set between opposing forces, and which has now been restored by the United Nations Development Programme (UNDP). Above street level, however, windows are smashed and buildings are charred. Just beyond the busy centre is an apocalyptic wasteland of devastation. In all directions lie street after street of ruined buildings: pancaked, collapsed, crumbled, skeletal. A man carries building supplies on a bike while three others, heads bowed, push wheelbarrows laden with hand tools. Among the ruins I spot personal items – a photograph of a toddler, a violin case. A targeting map of the local area has been drawn on the interior wall of a room, the minarets of two nearby mosques clearly outlined. Between the sketched buildings a pair of missiles point towards each other. Tasir had returned to Homs a fortnight earlier to fix up the house so he and his sister Rouba, 42, could move back in. They have spent the past five years in Tartus, a city on Syria’s Mediterranean coast, in a purgatory of displacement amid throngs of others who fled there to escape the fighting. With no help forthcoming nor signs of progress in rebuilding his home town visible, he decided to take matters into his own hands. He leads the way up the staircase, as sunlight streams through holes in pock-marked walls. There are no windows or doors, and the house is little more than a shell but Tasir has mostly cleared it of detritus and it’s easy to imagine how life once unfolded happily here in the series of large rooms. A contentious pre-war plan to raze sections of the city and rebuild them with skyscrapers, known as ‘Homs Dreams’, has been revived. 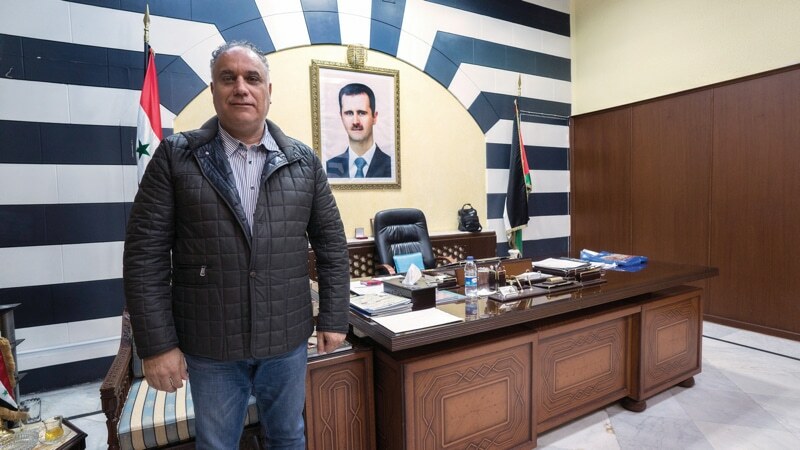 It has been criticised as a way of making pro-Alawite/Shia demographic changes – Assad is from the Alawite sect of Shia Islam – with Sunni-dominated areas slated for demolition. The governor tells me that “citizens’ rights are assured” in the areas earmarked for levelling. “It will be for people who live there to sell their properties if they like,” he says. “And they have priority rights to have alternative residences in the same area.” It will be a difficult scheme to implement. How do you assign value to homes which are destroyed? And how do you even talk to the owners? Nobody is here. 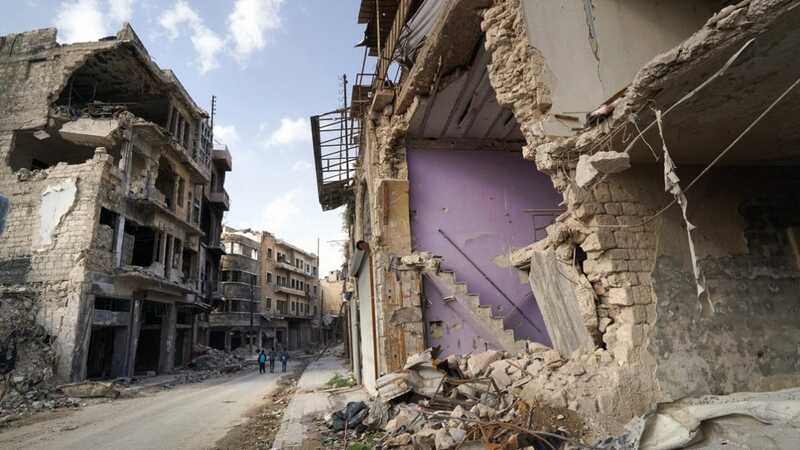 Homs rattles like an empty shell. Google Maps predicts an easy two-and-a-half-hour drive due north from Homs to Aleppo. But Google hasn’t accounted for the disputed areas of Northern Homs and Hama still being hard fought for in between. To avoid the fighting, our route took almost twice as long. It led us through checkpoints and past guns mounted on fortified positions, pointed towards contested areas. Past the tattered yellow flags of the Afghan troops imported to aid government forces. Past countless propaganda posters. Past mile after mile of dormant fields and dozens of damaged, uninhabited villages, until the road widened and a newly repaired four-lane highway undulated seamlessly into Aleppo, pictures of Assad fluttering off the central reservation and between the ruined buildings on both sides. A year after the end of the siege, a sign proclaiming #BelieveinAleppo in big blue letters has been erected next to the fortified walls of the Citadel, which has stood as guardian of the city since the 13th century. Damage to the Citadel sustained in the siege has been repaired and now the Syrian flag flutters atop. Relatives of regime ‘martyrs’ – deceased combatants who fought for Assad – ascend the stone steps and pass under his photo while visitors pose for selfies below. At the base of the Citadel, women are chatting over coffee at the green and orange tables of a café which opened four months ago and a vendor is selling bright pink candy floss. Nearby, workmen cut through stones and rubble as they repair the famous 150-year-old Carlton Citadel Hotel. Below the Citadel, however, Aleppo seems split into two cities which bear scant resemblance to one another. On the western side, handsome five-storey buildings with generous balconies line streets busy with shops and restaurants. Humming generators provide electricity day and night. In the east, though, it is a different story. The formerly rebel-held side of the city is a desolate hulk of obliterated homes and businesses, where people are struggling to live wherever and however they can. There are no generators here at night, just a smothering darkness. In what used to be known as the “streets of cafés”, an apocalyptic scene of destruction spreads to the horizon. Abu Muhammed, 57, picks through the debris of the stores and eateries that crowded the lively streets before the war, collecting small pieces of wood for the fire he depends on for cooking and heat. Prior to the war, he explains, he had a house and a successful bookstore in East Aleppo which provided a solidly middle-class existence for his family and enabled him to travel to Mecca four times. But both his home and his business were flattened in the war and he now rents the skeleton of a house. “A ruin with no walls or doors,” he says with a grimace. “Everything has been destroyed completely. Now we are at zero.” In another part of East Aleppo, I see families living in a building whose front has been sheared away. A small child peeks out from between his mother’s legs as she briefly parts the blue tarp which does duty as both walls and doors. There is nothing between the child and the ground, four floors below. 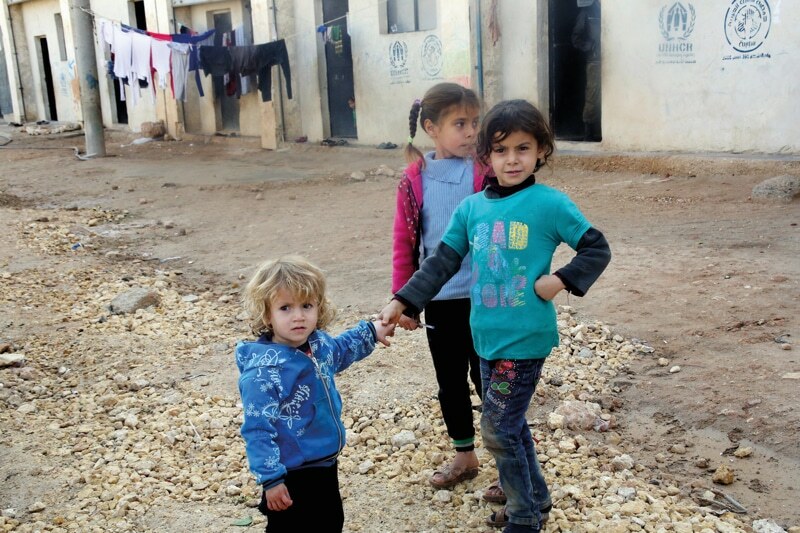 In 2004, the UNDP estimated that 30 percent of Syrians were living in poverty. By 2014, the estimate had jumped to 82 percent. In 2018, 13.1 million people are dependent on aid according to United Nations Office for the Coordination of Humanitarian Affairs (OCHA) figures. The poverty is clear to see in East Aleppo. Soup kitchens are thronged and streets are dotted with people holding small white buckets awaiting aid deliveries. 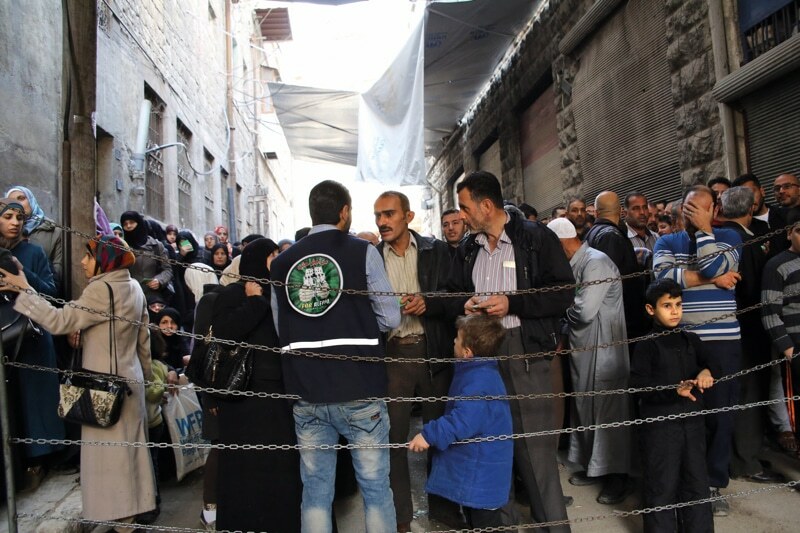 In the Khaliseh neighbourhood, a crowd has been waiting for hours for the blankets, nappies, foam mattresses, tarps, foodstuffs and other essentials being distributed by the World Food Programme and United Nations High Commission for Refugees. Between 400 and 500 people show up six days a week at this aid point alone, according to Muhammed Ali Soubahan, 29, who works at the distribution site. Instead of resuming school, children are put to work to help put food on the table. Young kids can be seen everywhere hauling sacks, pushing wheelbarrows and grilling meat. A cluster of silver skulls dangle from 11-year-old Mahmoud’s neck as we talk in the plaza beneath the Citadel. He is working for a tailor, he explains, as the shiny skulls of his pendant click against one another. Mahmoud had been in school when the war arrived – a war in which his brother was killed, his family was forced to flee three times and he was left injured and haunted by nightmares. “It was so scary,” he tells me. “We saw so many dead bodies. We saw them killing people – we saw terrorists cutting heads.” His voice trails off, his green eyes downcast. All over East Aleppo, it’s the same story. Dreams derailed in war are now endangered in ‘peace’. Aleppo was the industrial and economic powerhouse of Syria before the war. Its 40,000 factories of all sizes employed 800,000 people. Now, the main industrial parks are destroyed. At the Balleramoun industrial park, ruined buildings spread out as far as the eye can see. 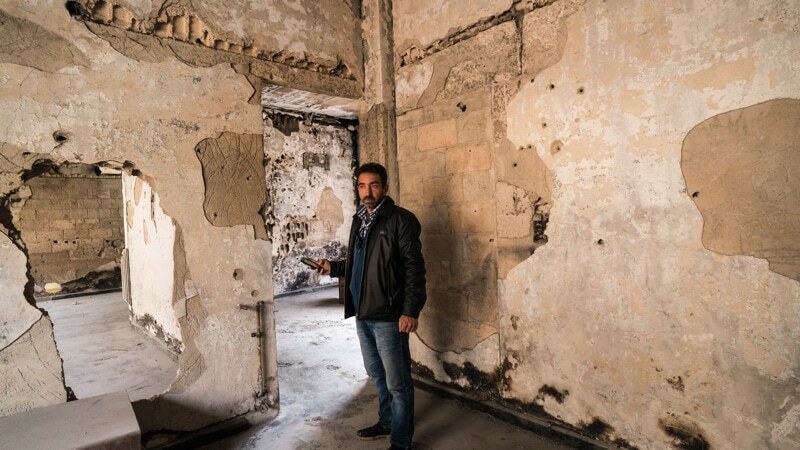 Yasin Nasi shows us inside the factory opened by his father in 1950, now scorched and gutted. A mural featuring a river of blood spreads over the wall of a room used as a prison by ‘Brigade 16, Groups of Martyrs of Badr’, a rebel militia group whose name is scrawled nearby. Nasi estimates it would cost a trillion Syrian pounds (£3.4 million) to get the factory back up and running. “Who has it? Aladdin?” he asks. I walk past block after block of destruction and find a man perched on a first-floor loading dock at the only factory in the area being brought back to life. Inside, knitting machines are being readied for a resumption of work. The building is on the edge of the area controlled by the regime and mortars occasionally land here, launched from the trees beyond. As I step out on a balcony to see where the rebel lines lie, I am quickly yanked back by a factory employee. Snipers apparently also lie in wait. Some employers speak of plans to seek guest workers from India to fill their labour shortage. Meanwhile, a few miles away, 30,000 people displaced from the Aleppo governorate are sheltering in a vast complex in Jibreen. Many of these are hard-working farmers, who are finding it very difficult to be away from home, doing nothing at all while their land lies dormant. It is hard to say where the country goes from here. 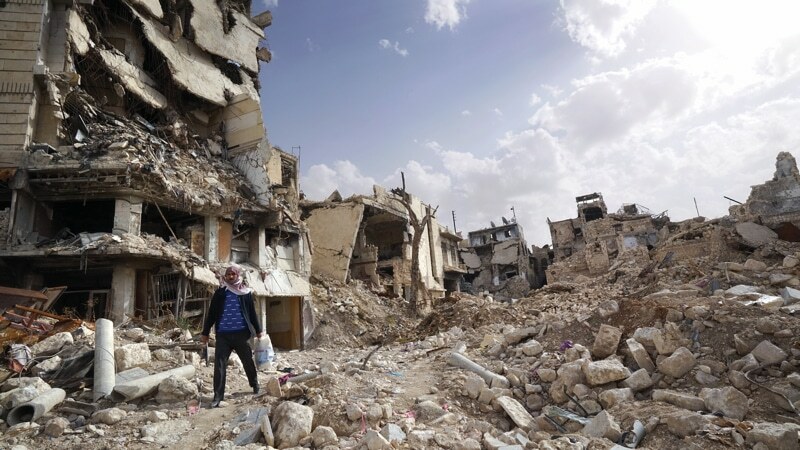 Syria’s problems go deeper than physical reconstruction: the very social fabric of the country has been destroyed. While the official policy is of reconciliation, recent reports of the arrests of some who have returned to East Aleppo paint a different picture. And while bombing in Eastern Ghouta during 2018 has resulted in the most casualties since 2013 and fighting deepens in new areas, the prospect of reconciliation and a definitive end to the bloodshed seems as distant as ever. With 5.6 million refugees abroad, 6.1 million displaced within Syria, unprecedented numbers dependent on aid, 1.75 million children out of school and recent assessments by the UN showing human development indices have been rolled back 35 years, it is certain the impact will be felt for generations. While visiting the Khaliseh neighbourhood of Aleppo I met Soubhi Shaikh Khamis, 32, who was standing in front of his tiny shop selling building materials. He was struggling with the rocketing prices charged by his suppliers and with limited demand – expectations that the construction business would boom have not been met as people can only afford incremental repairs. His business makes $100-$150 a day, and supports five families. But his main concerns were not financial. In April 2018 I find Fatima, now eight, on a respite break from Amman’s Hospital for Reconstructive Surgery and the extra surgeries that lie ahead. Fatima’s dad, Abdel al-Hanan Jasin, meets me in the street to show the way to the flat which Médecins Sans Frontières helped him secure. It is in the Wehdat district of Amman, Jordan, an area which began as a refugee camp for Palestinians and now accommodates Syrian refugees alongside the original inhabitants. We turn into a side street and, stepping carefully over the flooded entranceway, ascend the stairs to the second floor under the dim bluish glow of a single bulb. Kifa’a Jasin, Fatima’s 35-year-old mother, opens the door and light bursts in on the gloom of the corridor. Warmly welcoming me in, she motions for me to sit on the green floral patterned cushions lining the walls around a large red oriental rug. Fatima had barely dared look at me when we had first met a year earlier. The improvement in her appearance from when I last saw her is marked. Surgeons took the little healthy skin she had left and grafted it onto her head. They gave her the hair she is now wearing in cheerful bunches. But the most remarkable change is in her composure. She no longer cries when she sees her own face. She is no longer scared of the doctors, dying or needles like she was before. Now she is a mischievous dynamo of a girl, eager to be called back to the hospital, eager for the surgical procedures ahead which she hopes will make her “beautiful”. Fatima and her seven siblings bound around the room and as Kifa’a and Abdel laugh at the merry antics of their children, the horror of what these people have endured seems somehow even more cruel. Before the war Abdel Jasin had a successful clothing business, his family wanted for nothing. All his children were healthy and happy. Now, as they struggle to subsist on the rare bits of work they can find, they yearn to go back to Syria and reclaim their home, passed down through generations of the family. They share the same dream as millions of their compatriots. “We just want our life back again,” says Abdel. This entry was posted on Wednesday, April 17th, 2019 at 12:28 pm and is filed under Delayed Gratification magazine, From the archive.